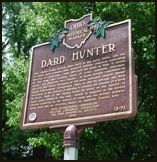 The Ohio Bicentennial Historic Marker honoring Dard Hunter and the Mountain House. Dedicated in October of 2003. Dard Hunter’s remarkable career as an artist, designer and illustrator had already been established through his work with the Roycrofters and in London and Vienna. But it would be here at Mountain House that he was to pursue a study that would eventually establish him as the world’s foremost authority on the history and craft of papermaking. In 1923, Hunter announced the publication of Old Papermaking which was written, set and printed entirely by hand at the Mountain House Press. Publication of this extraordinary volume brought instant acclaim and recognition from artists, collectors, papermakers and scholars around the world. Over the next five decades, eight masterful publications would be printed at the Mountain House Press by Hunter and his son, Dard II, who carried on the legacy in many ways, including the publication of his own magnum opus, The Life Work of Dard Hunter. Today, over thirty years after his death, Hunter is still recognized as the world’s foremost authority on paper and papermaking. The Mountain House stands today as testimony to what an individual can accomplish who has the focus, direction and inclination to follow their passions. 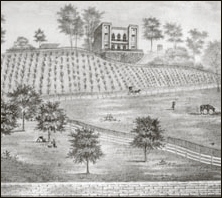 Each resident has left his mark - from the builder, Meganhoffen, who established the terraced vineyards on the steep slope in front of the house; to Dard II, whose masterful furniture adorns every room; to Dard Sr., whose archive of over 10,000 letters and an equal number of books serve as a distinguished archive of papermaking history. It is now our responsibility to ensure that the house and its contents remain secure for generations to come. The Mountain House and Dard Hunter Studios are open for tours. 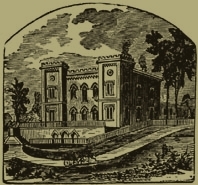 The Dard Hunter Library and Archives are also available for research. Please contact us for more information.